The westerners will take the positives after another tough night on the road. 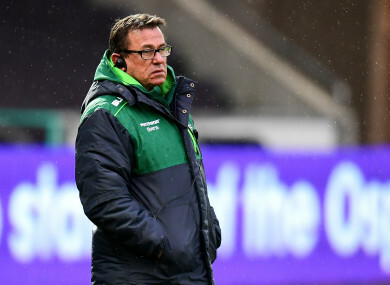 AFTER SEEING CONNACHT concede three first-half tries, Kieran Keane, the team’s head coach, feared the worst. So he was delighted to see the team finally get its act together against Glasgow Warriors after the break and put up a much better show in the second half. Nobody will ever really know how much it was a case of Connacht getting better and how much it was the Scottish side relaxing after securing the four-try bonus point shortly after half time, but there was a definite momentum swing and most of the second 40 minutes was played deep in Glasgow territory. Connacht scored one good backs try, one from a maul and were awarded a penalty try after demolishing the Glasgow scrum. That is the kind of platform a side can build on. “The result was out of sight but we were beaten by a pretty good Glasgow team with slippery backs. The pace of the game beat us big time that first half. We were passive in our defence and leaking tries,” Keane reflected. The second half-showing, however, must have given the players confidence that they can mix it with even the best teams in the league – the win meant Glasgow cannot be caught at the top team in the Guinness PRO14 Conference A and are guaranteed a home semi-final next month. “We are in a difficult spot,” Keane admitted. “People have momentum – Glasgow have momentum back after their downing by Scarlets. We suffer the same issue. We are coming back, though, and are really positive looking forward. This was another of those cases of finding the positives despite the result, not helped in Keane’s case by losing to a team run by Dave Rennie, his friend and former colleague at the Chiefs in New Zealand, for the second time this season. Email “'That saved us from embarrassment' - Keane pleased to see Connacht spirit despite defeat in Glasgow”. Feedback on “'That saved us from embarrassment' - Keane pleased to see Connacht spirit despite defeat in Glasgow”.